What Do All But One Of The Republican Senators Who Voted To Reverse Trump’s “National Emergency” Have In Common? “I am a member of the Senate, and I have grave concerns when our institution looks the other way at the expense of weakening Congress’s power. It is my responsibility…to preserve the separation of powers…. He didn’t. More than likely because he is up for reelection next year. And apparently decided public rejection of the President’s will is too politically risky. 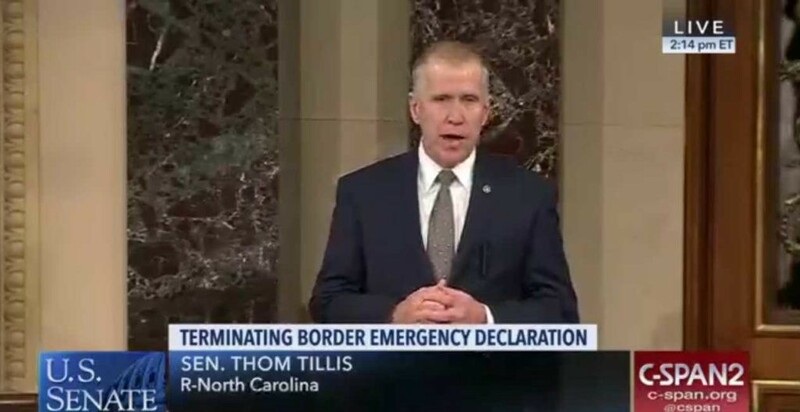 The Washington Post’s Robert Costa reported Republican operatives were indeed poised to draft primary challengers to Tillis, had he voted as he initially intended. The final vote? 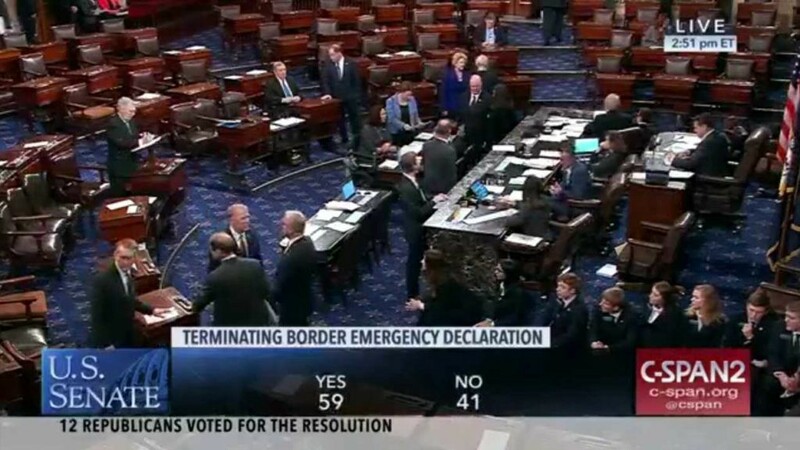 59 to 41 in favor of the resolution to reverse Trump’s national emergency declaration. Here’s a link to the results of the roll call vote. 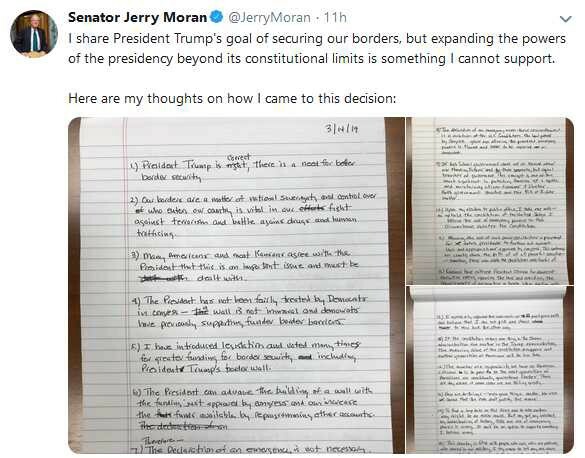 And although more Republican Senators voted against Trump than initially anticipated, the awkwardness and potential peril of the moment was palpable, with many of them going to great lengths to explain they are not against the President’s policies, just his method. And if you want to look at it in a glass-is-half-empty kind of way, 41 Senators, Republicans all, were perfectly willing to make themselves subservient to this President, and fail to defend one of the most central parts of the Constitution. The 12 Republican Senators who voted to reverse the emergency declaration are: Lamar Alexander of Tennessee, Roy Blunt of Missouri, Susan Collins of Maine, Mike Lee of Utah, Jerry Moran of Kansas, Lisa Murkowski of Alaska, Rand Paul of Kentucky, Rob Portman of Ohio, Mitt Romney of Utah, Marco Rubio of Florida, Pat Toomey of Pennsylvania, and Roger Wicker of Mississippi. So a good cross-section (except, as we’ve said, of those Republicans up for reelection in 2020). Several of those Senators are the same folks who’d been scrambling to find an alternative that Trump would accept, meeting repeatedly with Vice President Mike Pence. A small group of Senators who did end up siding with Trump, showed up at the White House Wednesday night to try to talk Trump into taking an alternate path, but to no avail. Almost immediately following the vote Trump Tweeted one word, all caps: “VETO!” Which of course he’ll do, and then the House and Senate will have to find the votes to overturn that veto, which they probably won’t. Still, it’s the first time more than a couple of moderates and/or iconoclasts in the Republican party have stood up to Trump on virtually anything, so it’s tremendously significant. Not to mention completely necessary.